The goal of this volume is to explore the social and political dynamics of rumor and the related concept of urban or contemporary legend. These forms of communication often appear in tandem with social problems, including riots, racial or political violence, and social and economic upheavals. The volume emphasizes the connection of rumor to a set of social concerns from government corruption and corporate scandal, to racial, religious, and other prejudices. Central to the dialogue are issues of truth, belief, history, public policy, and evidence.Rumor has been recognized as one of the most important contributing factors to violence and discrimination. Yet, despite its significance in exacerbating social discord and mistrust, little systematic scholarly attention has been paid to the political origins and consequences of rumor. Rumor is defined as a proposition for belief that is not backed by secure standards of evidence. Rumor can be traditional or not, and can be expressed as a simple claim of fact. In both instances groups of claim-makers, operating out of their own interests and with a set of resources, attempt to depict reality, and if possible, impact the future.The need for this book is underscored by changing patterns of technology. What in the past was grounded in face- to-face interaction is now often found on the Internet, which is a major source of rumor. An appreciation of how new electronic forms of communication affect communal belief is essential for explicating rumor dynamics. The volume is comprehensive. Essays cover race and ethnicity, migration and globalization, corporate malfeasance, and state and government corruption. 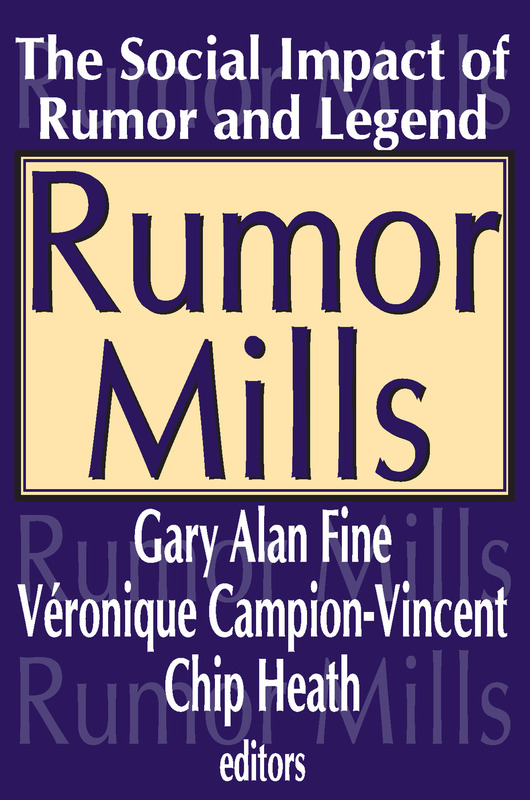 While editors and contributors well appreciate the dynamic nature of rumors and legends, the high quality of the effort make it evident that the issues that are raised and reoccur will serve to channel and inspire research in this major field of communications research for years to come.